The Days Ahead: Jackson Hole Symposium, which is often a good source of Central Bank think. Very thin economic reports and corporate earnings season is all but done. Wage increases are barely positive and we believe even those numbers are inflated by supervisory pay. 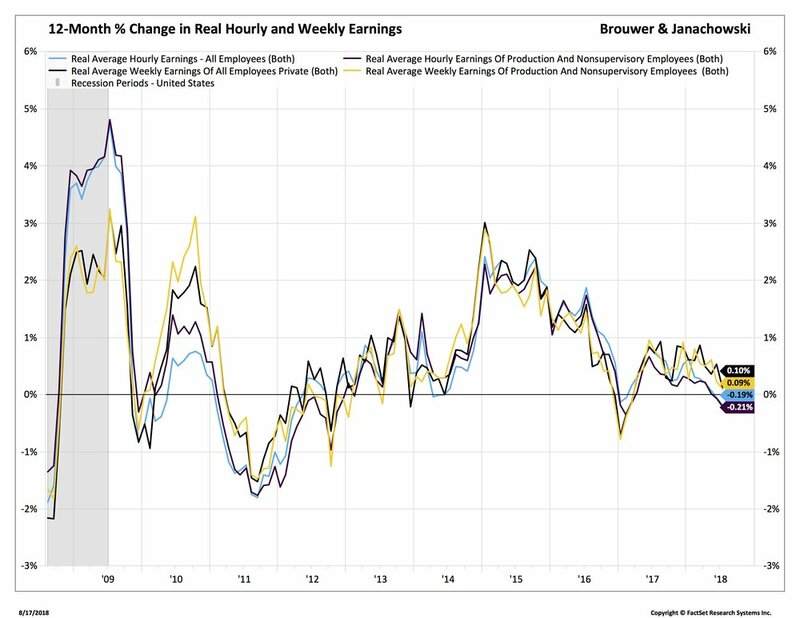 In other words, non-supervisory employees are seeing negative growth in real wages. There are many more workers than bosses so we think the average number is misleading. And it’s been happening all year. There are plenty of plausible and conflicting reasons why this is happening but none are important to markets right here right now. We'll just leave it that consumer spending cannot sustain a 4% growth rate. Wages aren't strong enough. Gold was down (it usually drops if the dollar strengthens). The S&P 500 finished mostly higher with defensive sectors (telecomm and staples) ahead. The 10-Year Treasury was up. Economic news was mixed. Slow housing starts. Strong retail sales. Productivity growth stayed around its recent, not-so-great trend. Tesla dropped and Elon Musk apologised. Not increase bank rates and keep your son-in-law as head of Finance. One might reasonably ask why Turkey, with its 1% weighting in the Emerging Markets stock index brings everything else down? It’s mostly because of contagion fear. First there are European banks with outstanding loans to Turkey. Those loans will be impaired. Banco Bilbao, in Spain, is down 13% in the last few weeks and down 25% over the year. Second, investors start to look at countries that share the same problems as Turkey, and number one on that list is South Africa. Third, there’s a problem with covariance in Emerging Markets. If a developed market runs into a recession, stocks fall and interest rates fall. So, there is some portfolio diversification benefit. But in Emerging Markets, currencies need protection so interest rates rise and stocks fall. There is no diversification benefit. Emerging Markets are also caught up in the Sino-U.S. trade war. News of renewed trade talks later in August helped markets recover on Friday but China is still slowing…the trade talks may help but signs in the currency (it’s down) and commodities (way down) suggest the Asian correction isn't over. Again, we’re using protection for what might be a troubled few months. 1. Securities Lending: Many ETFs lend out their securities to custodian banks. We could not find how much of the securities lending proceeds Fidelity will credit to the fund and how much to the investment company. The split should be around 80/20. Our guess is that the investment company will take a larger share. 2. Index: Fidelity came up with its own index to track the U.S. market. Again, nothing wrong with that but others like Blackrock, Schwab and Vanguard use external, independent indices. Which, we sort of prefer. They’re all bunched together but squint at the end lines and the extra returns for a $100,000 portfolio over 10 years for an investment in the top and bottom funds turn out to be $17,530. The best fund was not the cheapest. Nor was the worst (we’re talking relative here) the most expensive. It all came down to which index the fund tracked. Some indexes are better than others. So, pick your index, then the cost. Cheapest does not mean the best (h/t Dan Wiener). 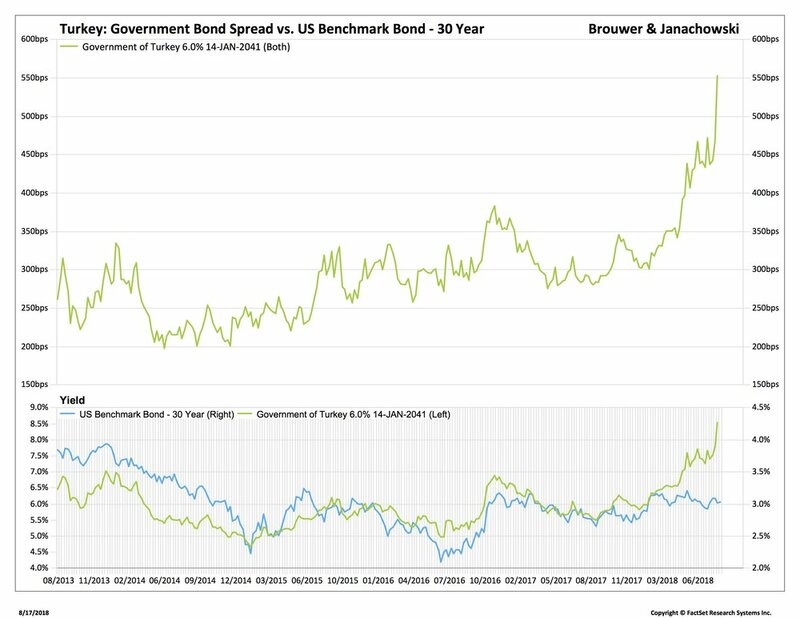 Bottom Line: Treasuries will remain bid, mainly because of the expensing of pension contributions we discussed last week. We'll be testing Emerging Markets contagion again.